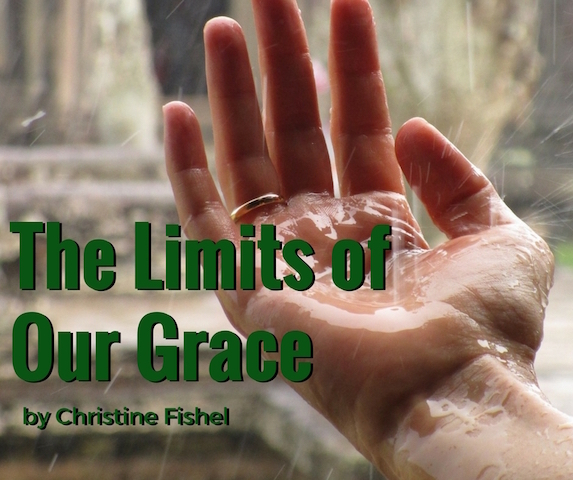 The first breakthrough I had in my faith was about grace. I had been raised in an “earn it” culture. If I followed the rules of our church and our family, I was loved. If I stepped outside of that, I was not. Even questioning the rules was enough to ban any one of us from the privileges of membership. When I left home for college, I was filled with frustration and unanswered questions. I was a seeker to the core, and my church and family membership were hanging by frayed threads. I was overwhelmed when grace first came to me. I had screwed up my life badly, making life choices based on a broken heart and confused perspective. One dark day I realized I couldn’t make my life what I so deeply desired it to be. No matter how hard I tried, I couldn’t do it. I clearly remember being on my knees, face pressed into the carpet in front of my lit fireplace, silently screaming into the plush fibers: Please God. Help me. I need you. I felt so alone. Grace rained down on me. I realized later that my Lord gave me the one thing that would turn me toward Him: undeserved and unexpected love. He loved me. Not because of what I’d done. Not in spite of what I’d done. He knew me and he loved me—two things that I’d never known could exist side-by-side. It took my breath away. A thought hit my heart hard today: Why is it that we grace-receivers are so stingy in giving our grace to the broken? Someone I love dearly was recently discovered to have a secret and dark side. He has committed crimes. I have known him his entire life, and I know that this dark side is not all of who he is. It is a piece of him, certainly, rooted in hurt like my own years ago. But now that this darkness has been brought into the light, I have hope. I believe completely that my Lord is seeking this loved child, and that the darkness can be uprooted and disposed of. And so, in faith, I have asked everyone I know to pray for him. Pray that he would see God beckoning him. Pray that his broken heart would allow grace to seep in through the cracks. Pray that his heart will be drawn to Christ and made new. I know prayer warriors. They have prayed for this loved one since my first emotional plea. They understand the whole picture of the situation, and they know Jesus intimately. Even in their humanness, they are able to know and to pray. It’s an act of grace toward this broken man. But there are others. It hurts to know that there are others who cannot find grace within them to pray for this child of God I love. Like in the culture in which I was raised, he is labeled undeserving. There are sins that can be forgiven by people, and sins that cannot. And yet. Isn’t it our God who showed us that all sins are the same and therefore all are equally evil and equally forgivable? This one I love, he doesn’t even realize yet that he is a child of God, but I believe it is coming. I believe there will be a day soon when God’s grace overwhelms him, rips the ground out from under him as he feels the undeserved and unexpected love. This experience has led me to wonder. Who have I not shown grace because I thought it wasn’t deserved? Who did I not pray for because, in my arrogance, I believed the person deserved to be separated from God for his crime? I am ashamed of the woman who thought those unloving thoughts. I pray today for my always-forgetting mind to never forget what I was given and to never refuse to give it to the most broken sinner among us. I pray for my judgmental thoughts to be stripped from my heart, for my knowing to rest right beside my loving. I pray for this saving grace that was poured into me to spill out and into others.